Are Vaccines fueling the autism epidemic? Already, at the extreme beginning of the exponential growth rate of autism in the US, 1 out of 66 children in Maine, Minnesota, and Oregon, and 1 out of 25 (or 400 per 10,000) boys in Arizona, have autism. This compares to 0.06 out of 100 adults in Ireland, and 0.03 out of 100 (or 3 per 10,000) 12 year olds in Ireland. This means boys in Arizona 133 TIMES more likely to have autism than Irish 12 year olds. "The first signs of autism usually appear as developmental delays before the age of 3. Autism is described as a �spectrum� disorder. This means that the symptoms and characteristics of autism can present themselves in a wide variety of combinations and can range from mild to severe. Two children with the same diagnosis can act very differently from one another and have varying skills. As stated above, the numbers of those diagnosed with autism is rising. In a recent briefing the National Autistic Society in the UK confirmed that the condition now affects 1 in 166 children in the UK and there is no reason to believe that incidence in Ireland is any different. Although it is widely maintained that the increase in incidence can, in part, be attributed to better diagnostic procedures, it is apparent that the condition itself is reaching epidemic proportions worldwide." 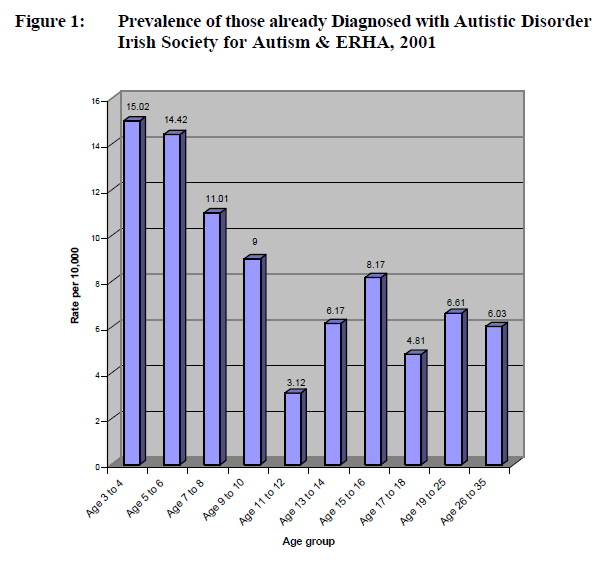 Actually, there are MANY reasons to believe that the autism rate in Ireland MUST be much lower (or even non-existent relative to) the UK, not the least of which is the above graph, not to mention the virtual prohibition of contraception in Ireland. Special education students with autism in California have more than tripled in number since 2002, even as overall special education enrollment has remained relatively flat, according to an analysis of state education data released yesterday. More than 680,000 students � 11 percent of all California public school students � are enrolled in special education. The number of students diagnosed with autism climbed from 17,508 in 2002 to 59,690 in 2010, the Lucile Packard Foundation for Children's Health found. [at this rate, there will be 203,000 by 2018, 692,000 by 2026, and 2.4 million by 2034, by which time California's spectacular bankruptcy will have been ancient history]. Students with autism represented 8.8 percent of all special education enrollment last year, up from 2.6 percent in 2002. Other health impairments � defined by the state as "limited strength, vitality or alertness, due to chronic or acute health problems," such as a heart condition, asthma, epilepsy or leukemia � are also on the rise, comprising 7.9 percent of disabilities among special education students. At the same time, the number of special education students with a learning disability � the most common diagnosis � is falling. In 2002, 52.4 percent of students had a learning disability, compared to 42.3 percent in 2010. Speech or language impairment affects about one-quarter of special education students. The data do not explain these shifts in disability diagnoses. The foundation has asked the public to provide perspective on the trends, which track with special education figures nationwide. Autism is the fastest-growing student disability in the country, and learning disability rates are declining, according to a 2009 report [PDF] by the Public Policy Institute of California. Disability and special education data by county and school district are available at kidsdata.org. [California spends $30,000 per year for autistic students, but only $4,064 for students with other disabilities. with 60,000 students with autism, this cost alone was $1.8 billion in 2010, it will be $6.1 billion by 2018, and $20.2 billion by 2026]. "What is happening in Oregon and Minnesota? The theories of pollution, lead poisoning or mercury poisoning cannot explain why they have a higher prevalence of autism than Louisiana, New Jersey, Texas or Mississippi. Oregon and Minnesota do not have higher vaccination rates than the rest of the country, and their parents are not any worse or any better than the rest of the US. The difference occurs because the Individuals with Disabilities Education Act lets the individual states decide the details of eligibility. They cannot be more restrictive, but they can be more permissive. As a result, most states either use a slight modification of the DSM IV criteria or have the diagnosis of autism made by a qualified medical professional. Washington does this, for example, but Oregon and"
Around the world, autism is linked to use of the birth control pill. For example, the autism rate in Ireland is effectively zero, compared to one in fifty in some states. If the historic rate of autism in boys in Arizona has continued since 2006, then it's already possible that 1 in 25 recently born boys in Arizona have autism. 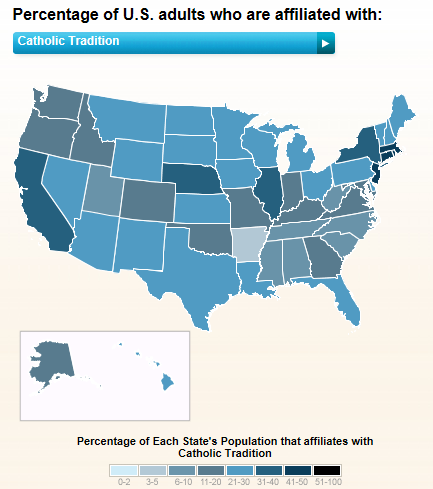 Generally, the states with the highest percentage of Catholics are those with the lowest use of contraceptives. So we should expect states like Massachusetts, New Jersey, New York, and Connecticut (the states with the highest percentage of Catholics) to have the lowest rates of autism (which they do). 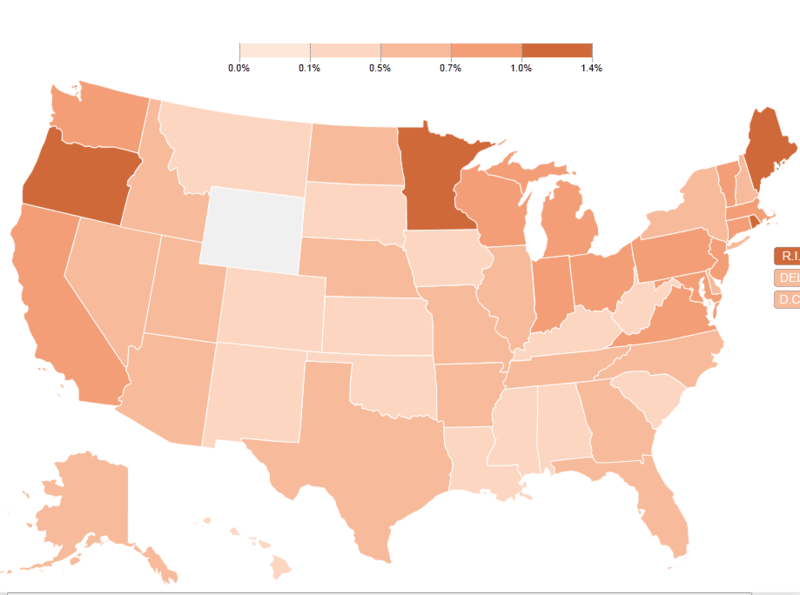 Conversely, we should expect states like Maine, Minnesota, and Oregon (the states with the lowest percentage of Catholics) to have the highest rates of autism (which they do). In between these two extremes? More later. The journal Annals of Epidemiology has published a new Centers for Disease Control and Prevention (CDC) article: "Have Secular Changes in Perinatal Risk Factors Contributed to the Recent Autism Prevalence Increase? Development and Application of a Mathematical Assessment Model." CDC?s Autism and Developmental Disabilities Monitoring (ADDM) Network estimates that an average of 1 in 110 children in multiple communities in the United States who were 8 years old in 2006 had autism spectrum disorder (ASD). That estimate represents a 57% increase in the prevalence of ASD since 2002 (1). The reasons for the increase are not completely understood. For this study, researchers developed a mathematical model to estimate how changes in pregnancy and birth factors during the period from 1994 through 1998 might have contributed to the subsequent 57% increase in ASD prevalence. The model developed for this study will be useful for future research and can be used to assess other risk factor scenarios. You can read the abstract of the article here. Following is a summary of the findings from this article. ◦Had a strong association with ASD. ?For each of the six pregnancy factors assessed (preterm and very preterm delivery, low and very low birthweight, multiple birth, cesarean delivery, breech presentation, and in vitro fertilization or other assisted reproductive technologies (ARTs), the likely effects on the recent ASD increase observed for the period from 2002 through 2006 were minimal. These specific factors were chosen for study, because they all have increased in recent decades. ◦The data showed that each pregnancy factor likely accounted for less than 1% of the total 57% increase in ASD?that is, these risk factors would have caused the ASD prevalence to increase only from 6.0 to 6.1 children per 1,000. These findings suggested that it was very unlikely that any single environmental factor could have been responsible for such a large increase in ASD prevalence during such a short time period. The model developed for this study will be useful for future research and can be extended to assess various risk factor scenarios. Though this study didn?t rule out that the perinatal factors assessed might put an individual at a higher risk for ASD, it did confirm that these factors alone were not likely responsible for the 57% increase in overall ASD prevalence observed among the population from 2002 through 2006. ASDs are a group of developmental disabilities that often are diagnosed during early childhood and that can cause significant social, communication, and behavioral challenges over a lifetime. They include autistic disorder, Asperger disorder, and pervasive developmental disorder not otherwise specified. CDC?s Autism and Developmental Disabilities Monitoring (ADDM) Network estimates that an average of 1 in 110 children in the United States had an autism spectrum disorder (ASD) in 2006. That estimate represents a 57% increase in the prevalence of ASD since 2002 1. The reasons for the increase are not understood completely. We at CDC know that, in the past decades, part of the increase was because of the changes in diagnostic criteria and the addition of autism as a special education category in public schools. Also, it is likely that increases in the prevalence of ASD are explained partially by greater awareness of autism by doctors, teachers, and parents. But, with the limited data currently available for many risk factors, we also cannot rule out that part of the increase might be related to an increase in one or more of the risk factors for developing ASD. Studies have found that several pregnancy-related factors could be risk factors for ASD 2. For this study, researchers developed a mathematical model to estimate how changes in select pregnancy factors (preterm and very preterm delivery, low and very low birthweight, multiple birth, cesarean delivery, breech presentation, and ARTs (fertility treatments such as in vitro fertilization)) might have contributed to the 57% increase in ASD prevalence. These specific factors were chosen for this study because they have all increased in recent decades. The mathematical model developed to estimate a risk factor?s likely effect on prevalence is based on how common the risk factor is among the population, how much the risk factor increases during the time period of interest, and how large the association is between the risk factor and having an ASD. For this study, researchers used data from the National ART Surveillance System (NASS) and the National Center on Health Statistics? Vital Statistics databases to calculate how much these risk factors had increased among the population from 1994 through 1998. Researchers reviewed the scientific literature to obtain the effect sizes, that is the strength of the risk factors associations with ASD. Combining information on the prevalence of these risk factors among the population, increases in the prevalence of the risk factors, and the strength of the association with having an ASD, the model produced estimated percentages of each risk factor?s contribution to the 57% increase in overall ASD prevalence. Following is an example of how this model could be applied to two different hypothetical risk factors. In each case, we assumed the risk factor increased substantially during a short time period. Both Risk Factor 1 and Risk Factor 2 increased in prevalence by 50% from 1994 through 1998. ?Children born with this risk factor were 2.5 times more likely to be diagnosed with an ASD than children who did not have the risk factor. ?Risk factor 1 could bring about a 4% increase in ASD―that is, the increase in risk factor 1 could have caused the overall ASD prevalence to increase from 6.0 to 6.2 children per 1,000. ?Risk factor 2 could bring about a 22% increase in ASD―that is, the increase in risk factor 2 could have caused the overall ASD prevalence to increase from 6.0 to 7.3 children per 1,000. Thus, even if a risk factor for an ASD were to increase substantially, it would not necessarily have a large influence on ASD prevalence. At CDC, we are working together with our partners to address the growing needs of thousands of families affected by ASDs and to understand the rising prevalence of these disorders. ?Monitoring ASD. The ADDM Network produces ASD prevalence reports that help us understand the number and characteristics of children with ASDs living in several U.S. communities. While many studies on ASD focus on small groups of individuals, the ADDM Network monitors these conditions among thousands of children from diverse communities across the country. This ongoing, population-based approach allows the ADDM Network to monitor changes in the prevalence of ASD and characteristics of children with these conditions, such as the average age of diagnosis and disparities in identification. These data can help communities to direct their outreach efforts to those who need it most. Learn more about the ADDM Network ? ?Researching Risk Factors or Causes of ASD. CDC also is searching actively for the causes of ASDs by exploring key areas such as the roles of genetic and environmental factors. Like the ADDM Network, CDC?s Study to Explore Early Development (SEED) is population based and is active in six states across the country, enrolling over 3,700 children and their families in the largest study of its kind in the United States. SEED is an important tool that we at CDC are using to understand what puts children at risk for ASDs and likely will give us many clues to help unravel the mysteries that still surround our understanding of ASD. Learn more about SEED ? ?Educating Parents and Health Care Providers. The earlier a child is identified with an ASD, the more he or she can benefit from early intervention services that research has shown can improve a child?s development. CDC?s Learn the Signs. Act Early. program is having an effect on the lives of families now by helping parents and providers recognize the early warning signs of ASD and other developmental delays and by promoting early screening, evaluation, and treatment, when needed. Learn more about the Learn the Signs. Act Early. program ? ?Schieve LA, Rice C, Devine O, Maenner MJ, Lee L, Fitzgerald R, Slay Wingate M, Schendel D, Pettygrove S, Van Naarden Braun K, and Durkin M. Have Secular Changes in Perinatal Risk Factors Contributed to the Recent Autism Prevalence Increase? Development and Application of a Mathematical Assessment Model. Annals of Epidemiology. 2011 Dec; 21(12):930-45. Epub 2011 Oct 13. 1.Centers for Disease Control and Prevention. Prevalence of autism spectrum disorders?Autism and Developmental Disabilities Monitoring Network, United States, 2006. MMWR Surveill Summ 2009; 58(No.SS-10). 2.Kolevzon A, Gross R, Reichenberg A. Prenatal and perinatal risk factors for autism: a review and integration of findings. Archives of Pediatric Adolescent Medicine. 2007; 161: 326-333.